This quick sauce is great for fish and vegetables. Serve with steak, chicken or fish. This recipe can be used as a dipping sauce for a large variety of asian food but also as a sauce for cooked pasta. The basil in the garden is gorgeous - time for pesto. Easy Pesto Recipe to serve over pasta, with seafood or just spread on bread. Recipe Submitted by Jill. Basil Mayonnaise Recipe is a good Salmon topper. Easy blue cheese dressing recipe. Serve with Buffalo Wings or over your favorite salad. 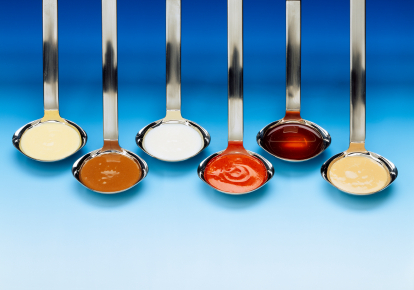 Sauces and condiments can jazz up a meal and add a whole new flavor profile to salmon or chicken. Try warm Mango Salsa on top of simply grilled tilapia for a flavorful, healthy treat, or whip up Seta's favorite - Bonefish Grill's signature Chimichurri Sauce - for a garlicky, fresh herb kick. For a taste of the islands. Great for burgers!!! Make sure you make it a day ahead of time. Easy Bearnaise Sauce Recipe. Goes great with a nice Filet Mignon. Easy Remoulade Sauce. Goes great with crab cakes or calamari. Green Peppercorn Sauce pairs well with Pork or Beef. Why buy store bought Lemon Curd when it is so easy to make your own. Great for scones, a filling for cakes or spooned on bread. No afternoon tea is complete without Lemon Curd. Very tasty Barbecue Sauce Recipe. It is best to let it rest for an hour or two before using to let the flavors mingle. Honey Mustard Sauce not only goes with chicken fingers but with shrimp, pork...let your imagination run wild. Our Horseradish Sauce Recipe goes well with Beef Recipes. Can be made in advance and refrigerated. Dry mustard provides a sharp, clear heat that you cannot get with prepared jarred mustards. Shamika's Easy Clam Sauce Recipe. Throw this sauce together, toss with pasta and dinner is ready. Marchand De Vin Sauce is excellent served over tenderloin, poached eggs or broiled chicken. Meaty Spaghetti Sauce like grandma used to make! It's her recipe! I use this sauce for my lasagna recipe also. This recipe can be made quickly with ingredients most homes have on hand. Tired and want a quick and good dinner but not out of a jar? Just whip up this tasty sauce and pour over some tortellini or spaghetti. When in a pinch this can be whipped up quickly with ingredients most of us have at hand. Very easy Peanut Sauce Recipes to use with Chicken Satay or whatever you prefer. The War Between the States is alive and well. Then it was North vs. South. Now it’s Red vs. Blue and Mustard vs. Tomato based BBQ sauce. It’s crazy. Can’t we all just get along? It’s all about the meat! This recipe is not a compromise by any means. This is “Peace Through Victory”. Here is a method and seasoning for Dry Rubbed Ribs, as well as a terrific BBQ sauce balanced to highlight the meat…imagine that. This is no wimpy sauce either. It's a thick, dark stick-to-your-ribs sauce. We’ve achieved just the right balance of Tomato and Mustard, sweet and spicy. If you don’t agree…change it and submit your own recipe.